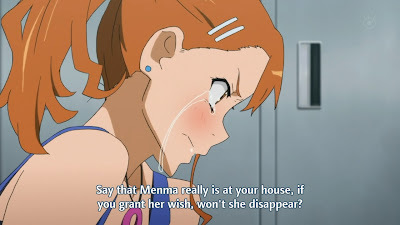 This episode did what many viewers - including me - have been asking for - nay, demanding since around ep02: it proved to people other than Jinta that Menma the Ghost was around. However, I feel that it was done in poor fashion, keeping with this anime's preference for strange plot holes. This episode wasn't a total waste, of course, since it did advance the plot in assumed ways. 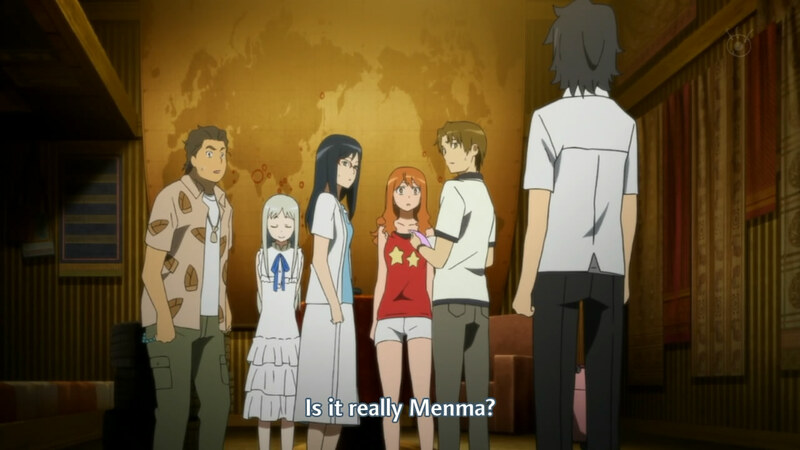 What is Menma's mother's name...? 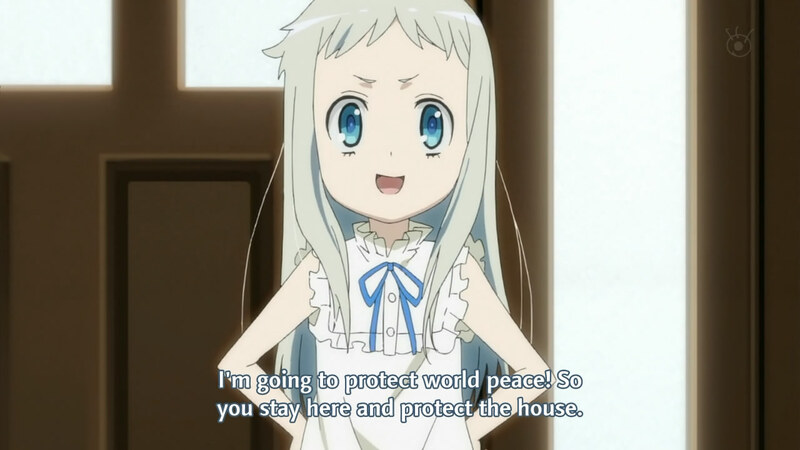 The episode began with Poppo gathering all the friends (except Menma) for a vist to Menma's household, since her father was the one to naysay the rocket plans. While her mother had been quite understanding and welcoming during the previous visit, she snapped during this one and blamed the friends for living. Even though it was a drastic departure from her previous characterization, it was actually believable; a person in mourning can be extremely drastic and almost bipolar. She was quite obviously always being held by a thin string, and thinking about how Menma wasn't able to join in on the festivities probably made it snap. Nonetheless, her outbreak caused repercussions throughout the friends - or, with another way of looking at it, regressions. He really should not take off that hat. One interesting aspect of this episode was Jinta's newfound understanding of parenting. In previous episodes, he had always been distanced from his father, sometimes even questioning why he wasn't getting nagged for not attending school. 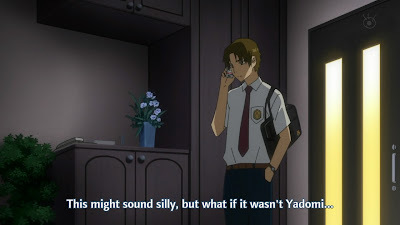 In this episode, he seems to finally realize that his father understands his pain and is quietly watching as he waits for his son to stand on his own feet. 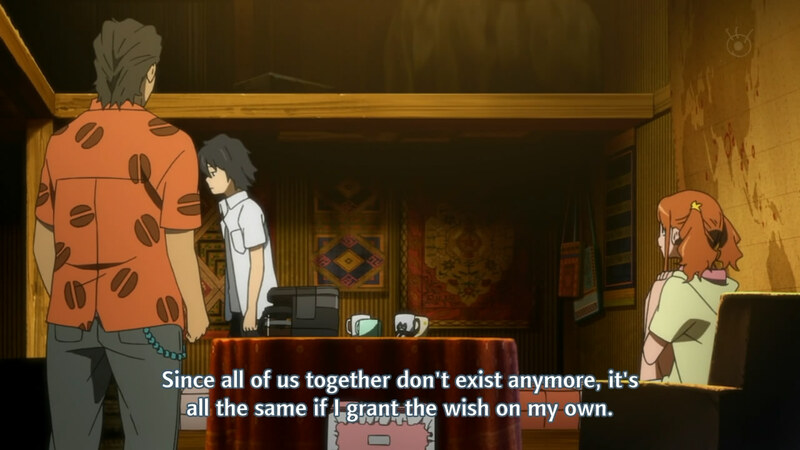 He passed this little bit of wisdom to Menma's younger brother, who blames his mourning parents for overlooking the fact that they still have a living child. This understanding, which I believe is really important in a world where passing the blame is the norm, made me hope that Jinta's character, despite annoying tendencies, voice-overs and actions, has hope. Trying all routes possible makes your point unconvincing. Jinta's urgent attempts at amassing the amount needed by himself culminated in falling unconscious after tripping off a ladder during his shift at the gaming store, where Anaru "nursed" him back to health...and proceeded to plead that he no longer act crazy. 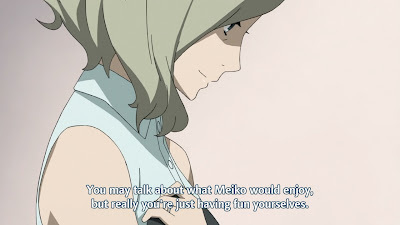 She revealed in words what her actions had already betrayed; she was jealous of Menma and was happy when Jinta said he didn't like her, but was extremely saddened when he ran out embarrassed because it was the equivalent of saying that he loved her. This guilt of having such selfish feelings, especially given that she died thereafter, seems to be the root of her mourning. However, when her confession to Jinta was met without recourse (I sincerely hope they do not end up together, but it seems like a done deal at this point), she attempted to goad him into not working by using the logic that fulfilling her wish meant she would go away, which would lead to Lonely Jinta. It didn't seem to work and she fell to her knees, covered in tears, like a typical shoujo heroine. She was pretty in-character in this scene, which affirms that I don't like her character all that much. At least the reason behind her guilt has been revealed, leaving room for redemption and acceptance. The scene of Jinta crying at the thought of (new) Menma not being around wasn't touching, but it did reveal a thought. 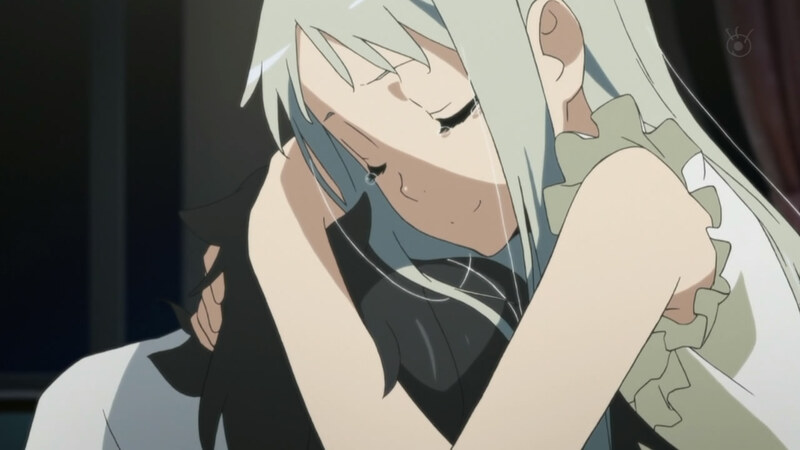 Menma seemed to have had more contact with Jinta's mother than the other children, and she seemed to have some kind of "motherly drive" to make Jinta feel better when he was crying. I'll be so angry if her wish turns out to be something along the lines of, "I don't want Jinta to be alone." ...I'll be even angrier if it turns out that Jinta's mother asked Menma to take care of her son, and she feels as though dying reneged on that promise. I'm probably way off (hopefully), but the episodes up until now have definitely been pointing to the possibility that her wish has nothing to do with her, really. The first sign of Tsuruko's downfall. 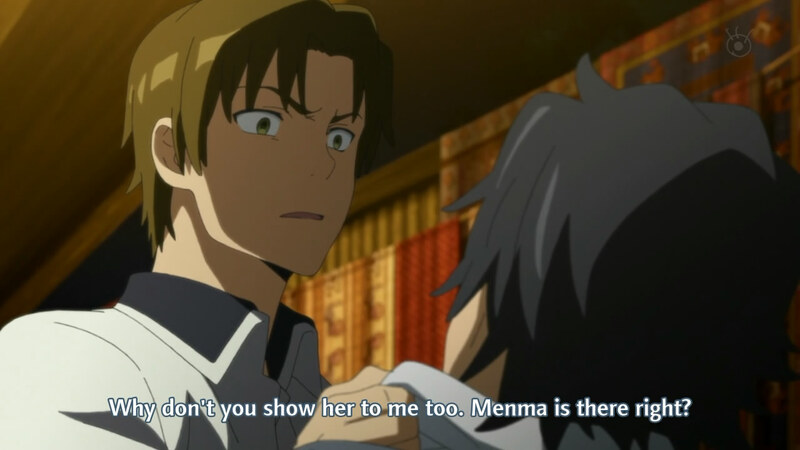 While Jinta and his father were bonding as his mother's grave, Menma decided to wander around and, after hearing Poppo talk about how it was wrong to not help Jinta, also decided to attempt to let presence be known. Of course, she took a strange, strange path by calling Tsuruko and Yukiatsu. They can't hear you. She's still a kid, so it's not easy to question her logic, but this led to a seriously annoying scene thereafter. We've all been asking that from the beginning. Jinta stumbled onto a secret meeting of the Super Peace Busters, who had gathered to discuss just how crazy he was. In classic Yukiatsu fashion, he lunged at Jinta in frustration, demanding that he either stop his lies or prove the truth. This was fine; Yukiatsu has never really believed that Menma was around, anyway. While the others were breaking up the fight (read: stopping Yukiatsu from killing Jinta), Menma happened to walk into the shack as well. This led to Anaru being angry that Jinta was still pretending Menma was around; this was also in character because she seemed to go along with the "Menma is here" theory only due to her feelings. Now that she'd been pretty much rejected, her anger allowed her to accept her true thoughts: she didn't believe Jinta. This line should have belonged to someone else. This portion bothered me the most, because it seemed completely out of character. Up until now, Tsuruko had seemed like the most down-to-earth of the group. While I'm not saying that she can't have a breaking point, I just don't see how it could have been triggered with no build-up. Whether or not she believed Jinta's words, she had been pretty objective up until this scene. Even prior, she seemed to be confiding in Yukiatsu that there was a minute chance, in her mind, that the calls had been from Menma herself. For her to lash out like this was not fitting with her character, and I do hope this gets explained properly later. I'm sure she has her own problems, especially regarding Menma's death; it just seemed out of place for her to be the one saying these words. It continued going downhill from there, with Menma dropping her diary onto the floor and all the friends clamouring to read it. 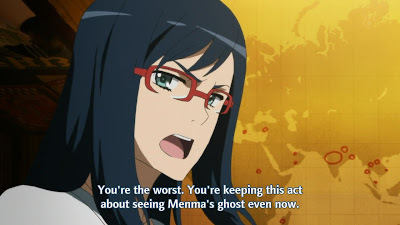 The most recent message was apparently written by Menma, talking about how she hung out in the shack with all of her grown-up friends and that she didn't want them to fight. Strangely enough, this much was enough for the friends to accept. I found this bit outrageous, given that they had been up in arms just moments prior. If something as simple as a diary dropping with no wind (when there was clearly enough wind to create doubts in their minds, since Menma brought some in when she first walked in and caused hair to fly) and then a handwritten message was enough to actually convince them that Jinta wasn't lying, then it really needed to have happened before they reached their respective breaking points. Little things don't convince you out of rage; real, solid proof only barely does. As unbelievable as it was, the friends shifted towards believing Jinta, for the first time. I really can't look forward to the next episode too, too much, as the plot holes just seem to be getting bigger. I understand that the writers waited until ep08 to prove to the friends that Menma was actually around because, up until now, it was also a question in the viewers' minds. However, I don't think they needed to wait so long and, on top of that, the way in which this episode played out was too erratic to accept. 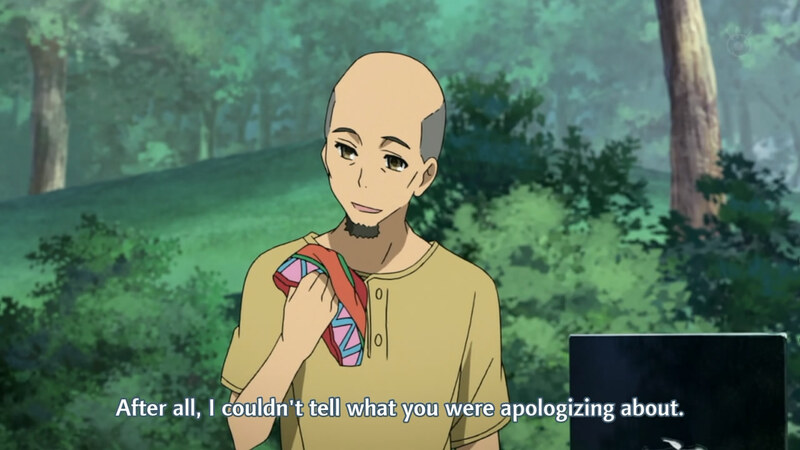 The friends all seemed to turn against Jinta (with the exception of Poppo, although he quite clearly didn't really believe in Menma either), and then a meagre thing like a handwritten message was enough to convince them otherwise. 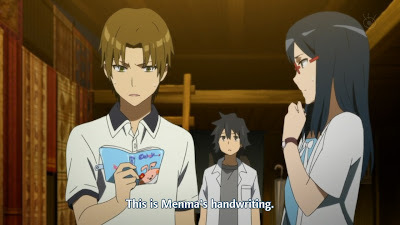 At the very least, things that couldn't be faked should have been shown - like Menma writing the message, or perhaps bringing the diary in. Unless, of course, items disappear when she touches them - although that would also be an unmistakeable piece of evidence. Tsuruko's character was also pretty butchered; she snapped and passed judgement on Jinta, when she hadn't been that kind up until now, and then suddenly became quiet, demure, and surprised at the message. That reaction, honestly, was more Anaru's thing. 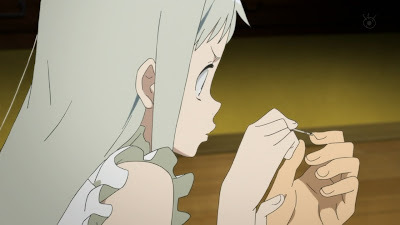 Despite such a long post talking about the things that bothered me about this episode, I still like the fact that the story is taking some direction other than the friends needing to depend on Jinta's word that Menma has a wish to fulfill. Ultimately, this anime is about the friends coming back together to lean on each other in times of sadness, something they were unable to do when the tragedy actually occurred. 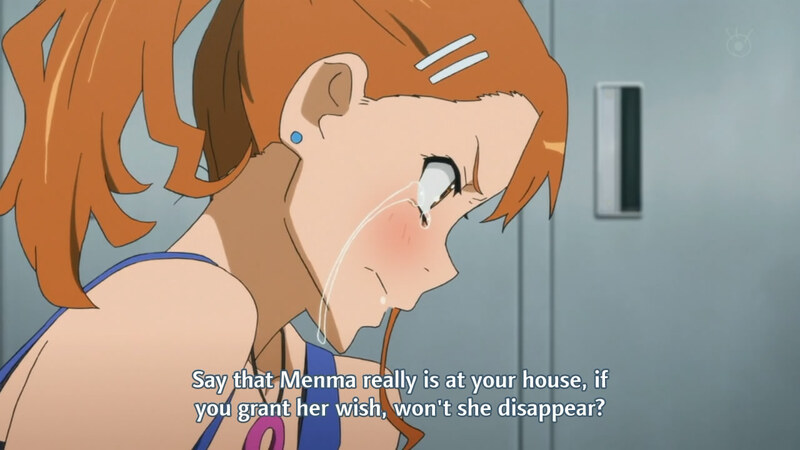 Jinta's character is not strong enough to do that without the aide of a ghostly Menma, unfortunately. My preference would have been non-supernatural assistance - but if there's going to be some, I prefer that all the friends know about it.